Creating this page as a place to drop and share character histories and backgrounds. All content here is expected to be OOC until and unless presented in-game and in-character. The young Togashi monk known as Kakuu of Clan Dragon was born Mirumoto Kaze – his birth name - just over sixteen years ago. 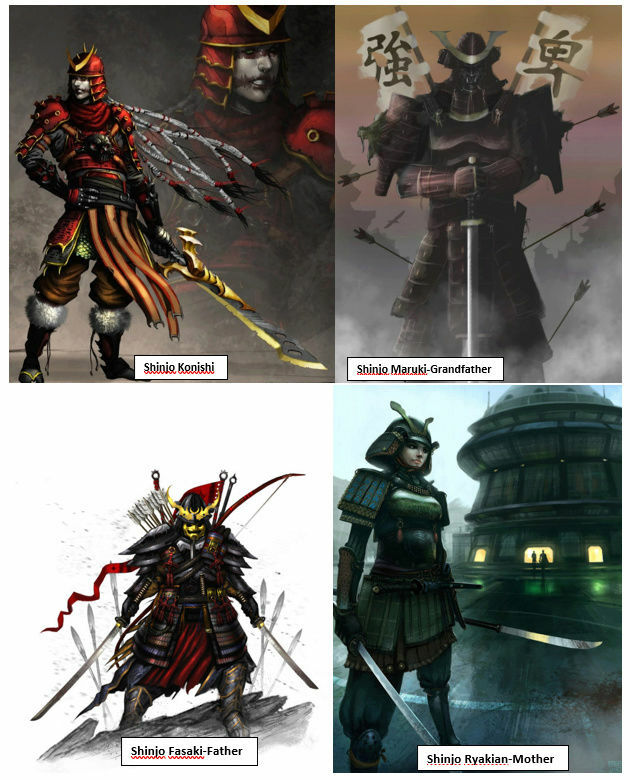 He is the only son of a retired Samurai father, Takati, and his concubine wife, Miko. Takati had become indebted to a fellow Samurai, Roguda, a couple of years prior to Kaze’s birth, and had owed this man a boon, which had been uncollected prior up to the time of Miko’s pregnancy. As she was with child, Roguda called upon Takati to collect; Roguda wanted Takati’s pledge that that child would be raised and groomed to enter the Mirumoto Bushi; the family Samurai numbers were thinning, and this first-born child was to be pledged to grow in their ranks. The asking of a first-born child was an immense request, but Takati knew that the boon which he owed was equally immense, and his honor bound him to agree to Roguda’s terms. Takati began the earliest steps towards raising Kaze to be a candidate for bushi at the age of four; handing Kaze wooden bokken sized for children, and playing with him in manner of fencing and melee. Over the next years, the grooming continued, as Kaze was trained in swordplay, fitness, and awareness, and was educated in the elementary studies of Bushido, history, and religion. Kaze learned well from these teachings, demonstrating retention, aptitude, and capability. The greatest challenge, however, came on Kaze’s eighth birthday… Takati told Kaze that next month, a Mirumoto Samurai would be visiting the nearby village, and would be auditioning prospective children for admission into the Mirumoto Bushi schools. Takati and Kaze would travel to the village where Kaze would be expected to demonstrate his learned skills and talents in front of the Samurai so as to earn his way into the Bushi school. This success would not only open the next chapter in Kaze’s life, but would also satisfy the boon owned to Roguda by Takati, and thus clear the debt. Kaze was immediately and vehemently opposed to this. Though he’d studied and learned and demonstrated skills, he did not wish or want to enter the Mirumoto school. He didn’t reject this for any reasons against the Mirumoto family or the Bushi Arts, but rather simply for the philosophical and moral objections that he wanted to choose his own fate. Takati was initially amused at his son’s stubbornness, and stated that was not the way of things; that Kaze was raised – bred and groomed – and destined to be a Mirumoto Bushi. Kaze held fast to his want for his own choice, and refused – stubbornly and blatantly – to audition for the Mirumoto Samurai. Takati’s initial amusement, yielded quickly to anger, and frustration, and outrage. That day, and night, and for the days and weeks which followed, there were arguments – raised voices and hands both – between Takati and his son on this matter. Kaze was terribly stubborn and resistant, though his father persisted with attempts to threaten, reason, convince, entice, or outright tell Kaze that he would audition for the Mirumoto Samurai; and yet, Kaze held fast in his rejection and stubbornness, and refused to practice or to study from the first day that the disagreement began. Miko, Kaze’s mother, though taken as Takati’s wife from being a simple concubine, had always loved Kaze, and admired his free will. Though she could never counter Takashi or openly defend Kaze’s will and choices, she counseled Kaze in private, and encouraged him to hold true to his want and will for something different. The day of the Mirumoto Samurai visit came, and as all attempts to reason, threaten, motivate, or otherwise encourage Kaze, Takati finally accepted the shameful truth that Kaze would not audition. Even if he was physically dragged to the town and shown to the Samurai, Takati knew that Kaze would not perform or audition; and that show (or lack thereof) in front of the Samurai, would be an even greater embarrassment than their lack of attendance. This lack of showing effectively defaulted on the promised payment of the debt owed by Takati to Roguda; this would cause great shame to Takati, show him as unable to fulfill his promise, and lose him honor and respect among his peers within the Mirumoto family. Takati was furious with Kaze, and ordered him out of his house – at eight years old, Kaze was being kicked out of his family’s house for bringing shame and dishonor upon his father. Takati stated that Kaze would NOT carry either the Mirumoto family name, or his given name away from the house (as Kaze had been a name of one of Takati’s and Kaze’s ancestors). Takati demanded that his son be stripped of the family names, and that the only thing that he would take away with him from this embarrassment, would be the new name of “Kakuu”; this name is a derivative of a Dragon slang word for failure, and Takati only called Kaze by “Kakuu” since that morning’s failure to show at the audition. The very next morning, Miko travelled to town to inquire at the temple of a home for Kaze (now “Kakuu”)… hoping that there was a family wanting to adopt, or that they had a recommendation other than the orphanage. The best alternative which she received was that of the Togashi Order of monks. The Togashi were known to accept all willing comers, and were in truth a brotherhood of those adopted and accepted from other families and backgrounds. Miko was unsure if Kakuu would embrace this, but she saw it as the best available option; certainly favorable to being disowned by Mirumoto with life in a terrible orphanage or on the streets. Miko presented this to Kakuu, and reasoned that this would be a far better option than the orphanage or the streets. Kakuu did not know much of the mysterious and seclusive Togashi monks, but knew that they were reputed to take in all coming willingly come to their Order, and had even heard rumors that they teach different (and some said radical) paths of wisdom, enlightenment, and Bushido. He knew that this preferable to the orphanage, and agreed to go to the Togashi. Though many within the Order recognized early on that Kakuu’s name was a slur, Kakuu kept the name as a badge and a reminder – of his pride and stubbornness, of what it cost him, and to drive him to succeed in whatever he chose to dedicate himself to. Though he never expects to confront his father again; Kakuu does want to succeed – to be respected as capable, honorable, and upholding all the tenets of Bushido – to prove his father wrong. Life with the Togashi Order proved to be a savior for young Kakuu. He’d found a group which valued the diversity of those who came to them; who appreciated the individuals, and the questions and creativity which came with them. The Order did not allow Kakuu or his fellow inductees to the Order to run rampant or un-restrained; they instead taught various methods to curb and control energies of the individual mind. Through education in Bushido, history, religion, and various other studies, their minds were opened and filled with wisdom; through hours of daily meditation and introspect, their spirits and souls were disciplined and focused; and through rigorous physical training in the martial arts – jujitsu first, but also kenjitsu and staff-disciplines – their bodies were honed and conditioned to be capable warriors. Kakuu never forgot what his mother did for him… how she was encouraging and supportive of his will during the fights with his father, and how she sought out the Togashi as a haven for him, to save him from the unknown threats of life on the streets or in an orphanage. Kakuu was not allowed to contact his mother in any way during his training; the Togashi forbade contact with students’ former lives (families and such) until they completed training and graduated Gempukku as a Samurai. Time with the Togashi passed by very orderly and very routinely – studies of Bushido and lores, meditation and focus, and physical training – consumed the days and nights, and months, and years… Kakuu learned, and matured, and grew – mentally, spiritually, and physically – strong and capable in all ways that the Togashi taught. Early on in his time at the Order, Kakuu was ostracized and even bullied a bit for his odd (and self-insulting) name which he carried. Kakuu needed only to break the nose, one leg, and four ribs of one of his bullies (with his bare hands) to halt that drama, and eventually, both Kakuu and his fellow students, overcame these initial… ah,… “setbacks”, and Kakuu earned the respect and liking of most of his colleagues. He even had a couple which one might call friends. Kakuu respected all of his Sensei at the Order. Don’t get it wrong that he was friends with them, or even liked them all; but they all – despite their various (and numerous quirks), and differing demeanors, personalities, and approaches – earned Kakuu’s respect. In his eighth year at the monastery, Kakuu was called to the head Sensei’s chambers. The Dragon Champion was visiting the monastery, and requested specifically an audience with Kakuu. The Champion directed Kakuu to trek to the Crane lands and compete in the Topaz championship. At 7 years old, Ao spent much of his youth traveling around the wall. Occasionally travelling out with the merchants to procure supplies, Ao caught glimpses here and there of how beautiful life outside of the wall can be. While the fellow crab travelling with the trading caravan sneered in disgust of the life that the other clans enjoyed, Ao found himself naively wanting to bring these luxuries back to the crab lands. Ao was always paying attention to how the other clans acted despite these luxuries. Even with these grand luxuries the other clans always seemed to be fighting each other over petty things. Ao’s father Hida Tsuyoi was very strict but kind in keeping the crab traditions prominent in Ao’s mind. Ao’s mother Kaiu Amai on the other hand was very nurturing and understanding of Ao’s curiosity of the outside world. This caused many conflicts in the home with other crab clan when Ao brought things back from the other clan’s lands. Despite the many things brought home, Tsuyoi and Amai still cared deeply for Ao even though the other crab thought poorly of them. At the age of 14 Ao went on one of the patrols beyond the wall with his father. The patrol went deep into the shadowlands, and seemed to mysteriously keep going on forever. Tsuyoi became aware of what was going on, and halted the group. The silence of the shadowlands crept in, and in a flash Oni crawled in. Tsuyoi bravely fought looking for an Oni in particular. The Oni that was playing tricks on everyone’s minds was standing in towards the back of the ambushing Oni. Tsuyoi cut his way through the thick of hideous Oni, and smashed his tetsubo into the Oni’s head so that the other members may escape. This however led to Tsuyoi’s demise as the other Oni surrounding the group focused now on Tsuyoi. Tsuyoi wildly swung as the claws tore into his armor, each swing becoming less effective. Ao watching in horror and fury, rallied the rest of the group to surge and while the Oni focused Tsuyoi, Ao like a crashing wave smashed Oni after Oni. The rest of the crab group started to encircle the Oni, but the tide seemed to be matched evenly as soon as the Oni knew what was going on. Tsuyoi seeing that the tides could use some tipping grinned at Ao, and pulled out a small bundle of sticks. The bundle of sticks was something that Ao brought home from one of his travels to the Unicorn lands. Tsuyoi struck a flint on his tetsubo and lit the sticks, and in a silent moment Tsuyoi and Ao shared a last moment of peace together as a wave of force exploded out from the center. The Oni reeled forward and became disoriented, this gave the Ao and the group of crab a chance to surge and finish the Oni off. Ao with unbelievable strength cracked through Oni after Oni. Sundering the arms, shoulders, and limbs of the each Oni, then moving onto the next. The last Oni standing over Tsuyoi’s body stood tall, grinning at the boy. Ao charged the Oni, moving instinctively while dodging the swings of the grinning Oni closed to swinging, but Ao didn’t stop at closing distance. The Oni tried grabbing at Ao, but somehow seemed to miss at all attempts. Ao nimbly climbed up the Oni, and then jumped straight upwards off the Oni’s shoulders and like a tsunami with a wave crashing down on a town, Ao’s tetsubo with an unimaginable weight crushed the Oni’s skull. As the smoke cleared and last of the oni’s fell, the other crab turned to look at Ao, and to their disbelief the Avatar of Hida seemed to be hovering as if it were Ao. The crab were stunned to see such a miracle standing before them. Ao gathered the troops crab and headed home with all members in tow. Word spread amongst the crab of this feat, which caused more attention that Ao wanted to focused on him. Ao however wanted to learn more about those sticks that Tsuyoi used, which causes Ao to think the outside world has more to offer than just its trouble. The duty to protect the wall and the people with which the wall encompasses all the ideals which he holds dear. He just has to find smarter and better ways to protect it. To this end Ao always seems to be searching for new weapons, tactics, and allies for the sake of furthering the crab’s effort in protecting the wall no matter how big or small the finding. Finally, +1xp when everyone does The Other 100 Points I'll post here soon. - This has been accomplished and the XP given. Name: Shinjo Konishi- See the scarring on face, everyone can see it but he cants. Shinjo Konishi grew up in constant turmoil, his parents (Shinjo Fasaki and Shinjo Ryakian) died in battle defending the Unicorn clan from a powerful force. Then was raised by His grandfather Shinjo Maruki who traveled the world learning everything he could to battle Shadowland taint and Maho but eventually fell to the embrace of them both, he became a very powerful user of the two and in turn shamed his family. Instead of choosing death he decided to flee but before doing so tried to corrupt Konishi, his young apprentice. As a child Konishi was vulnerable but so was his Grandfather thinking he was safe from Konishi, Konishi resisted what he could and stabbed his Grandfather which was eventually a fatal injury (or so he thought…). In doing so the Blood of his grandfather spilled onto his face causing him to be cursed (actually Shadowland Taint but he thinks he’s just cursed). Even though he killed his Grandfather and rejected the ways he incorporated in the end, he mourned him and still thinks of him as his greatest mentor. Konishi grew up fending for himself, learning to blend, emulating others and expanding off the teachings of others but never letting anyone close. Even though he is the one that killed his grandfather, he feels them judging him for Shinjo Maruki transgressions. Everyone actually pities him and stares at him for his misfortune because they see the scars his Grandfather left behind. As the years pasted Konishi realized, a maddening conclusion, he was scarred from the blood of his grandfather but he was unable to see the scars himself. So he secretly started researching and going through all of his Grandfather material to figure out how to reverse the effects of the curse. Gaining advanced knowledge of Maho and in doing so, unknowingly, furthering his progression towards his own Shadowland Taint. He often hears whispers of an unknown origin (possibly his grandfather, parents or something else). Something that is always pushing him along and occasionally doesn’t allows seem quite right but has never steered him wrong. Because of his drive to accentually restore his family name and the push from the unseen force he quickly started out shining his fellow Unicorn clan peers. Gaining him a ticket to compete in the Topaz championship. May the rest be History? a. Constantly trying to live up to Tsuruchi's living image. a. He is driven to create his own clan like his mentor Tsuruchi and nothing will get in his way. a. Believes that the GODS have forsaken us. Tsuruchi Shi no "Tenshi" (Angel of Death) takes pride in everything he does, he has no problem killing anyone who is guilty of what they have done. He only kills those who are guilty and rarely will take any bounty that there is a level of doubt of their innocents. Pride and honor are a driving factor for him for the Codes of the Wasp are tattooed on his body for that he’ll always remember it. He doesn’t wear the typical garb of a samurai, he wears a red hooded cape with a scarf that covers his face, his hair is platinum white and his eyes are cold blue. If he must kill someone after killing them he leans down and removes the scarf and whispers “Nothing in life is promised except death.” (why he is called the Angel of Death) He doesn’t celebrate the death of his enemies he simply “collects” them to be delivered to who has hired him.